Marketing Ghost Towns: the new tourism trend? Recently, I was invited to visit the town of Loverna, SK, a stone’s throw from the Alberta border, with a documentary film company out of Saskatoon. This experience — wandering through a virtually empty town, scaring the pigeon who had made his home in the curling rink foyer, visiting the still-used Anglican church, peeking in the windows of the old Elk’s Hall and garage — was a fun way to spend a day, if a little sad (even for a historian). There were surprises: the artifact I had originally dismissed as yet another old wagon proved, on further examination, to be a horse-drawn manure spreader — surely organic groups would hearken to the knowledge of prairie pioneers, pre-commercial fertilizer! The box of empty stubbie beer bottles at the back of the hall were another great find. 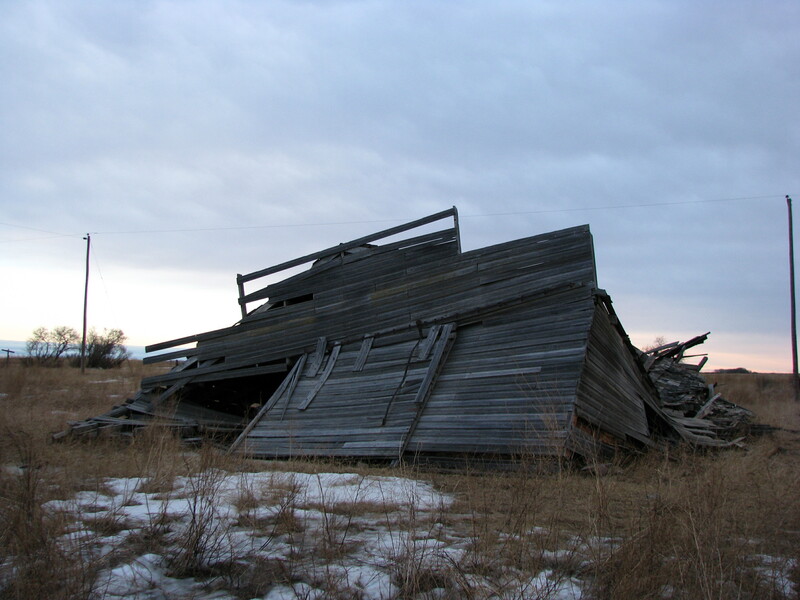 Saskatchewan is littered with the remnants of towns, villages, and abandoned farm yards, the detritus of humanity moving through the landscape and sojourning for a short but intense period of time. Other towns, of course, remain vibrant, even growing. New house starts in Biggar, an hour west of Saskatoon (where I live), have been phenomenal over the past six years. The so-called ‘Saskaboom’ is spilling back to the rural regions, at least those within striking distance of the major centers, or near the extractive industrial centers of potash, oil, or gas development. Ironically, although the region around Loverna is crawling with oil and gas workers — we saw no less than two helicopters in the area, in addition to extensive oil pump operations — workers are not moving back to the rural towns. Or at least, not Loverna. also, i think there was an issue of prairie forum given over to the history of historical sites in the prairie provinces. a fellow named don kerr has an article about saskatchewan’s historical sites. You’re right — the ‘Saskatchewan Monuments’ were a direct result of the provincial Golden Jubilee, which put a lot of money into roadside cairns, etc. What I see now is not so much cairns, but the physical remains themselves (if there are any to be found); and the ‘remembrance’ comes out as a collective participation in both the ‘ghost town hunting’ and the sharing of photographs online! Perhaps a nod to the ‘ordinary-ness’ of small towns and farms, not their ‘distinctiveness’, too (not a battle site or old fort, etc.). Thanks for your comments.